Encased in a matrix of extracellular polymeric substances (EPS) composed of flagella, adhesins, amyloid fibers (curli), and exopolysaccharides (cellulose, β-1,6-N-acetyl-D-glucosamine polymer-PGA-, colanic acid), the bacteria Escherichia coli is able to attach to and colonize different types of biotic and abiotic surfaces forming biofilms and colonies of intricate morphological architectures. Many of the biological aspects that underlie the generation and development of these E. coli’s formations are largely poorly understood. Here, we report the characterization of a novel E. coli sessile behaviour termed "crowning" due to the bacterial generation of a new 3-D architectural pattern: a corona. This bacterial pattern is formed by joining bush-like multilayered "coronal flares or spikes" arranged in a ring, which self-organize through the growth, self-clumping and massive self-aggregation of cells tightly interacting inside semisolid agar on plastic surfaces. Remarkably, the corona’s formation is developed independently of the adhesiveness of the major components of E. coli’s EPS matrix, the function of chemotaxis sensory system, type 1 pili and the biofilm master regulator CsgD, but its formation is suppressed by flagella-driven motility and glucose. Intriguingly, this glucose effect on the corona development is not mediated by the classical catabolic repression system, the cyclic AMP (cAMP)-cAMP receptor protein (CRP) complex. Thus, corona formation departs from the canonical regulatory transcriptional core that controls biofilm formation in E. coli. With this novel "crowning" activity, E. coli expands its repertoire of colonizing collective behaviours to explore, invade and exploit environments whose critical viscosities impede flagella driven-motility. Bacteria were traditionally considered single-cellular forms of life. In the last few years a Kuhnian paradigm shift has brought us to the realization that bacteria, on the contrary, are gregarious organisms enjoying an intense array of social activities and living in complex multicellular communities[1, 2]. Thus, sociability, i.e., bacteria as highly communicated and organized societies, and multicellularity, i.e., different kinds of phenotypically differentiated (with different functions) sibling cells working together as a unique organism to reach a "common goal" of survival and organismal reproduction, represent the new conceptual framework with which to understand the microbial world[3–7]. A bacterial multicellular formation that allows this realization to be clearly understood is the biofilm[8, 9]. Biofilms are defined as matrix-enclosed communities of microorganisms tightly interacting with each other, attached as a whole to a living or non-living surface[9, 10]. In Escherichia coli the extracellular matrix is formed by a variety of extracellular polymeric substances (EPS), adhesions: type-1 pili, amyloid fibers (curli) and exopolysaccharides: cellulose, colanic acid[11, 12], β-1,6-N-acetyl-D-glucosamine polymer (PGA)[14, 15] (reviewed in reference). Bacterial flagella have a positive role in nascent biofilms, facilitating initial attachment to surfaces, maturation and microcolony spreading as well as carrying out a structural role. Interestingly, it has been described that the type-1 pili and the outer membrane Ag43 are two factors that influence the colony morphology of certain E. coli K-12 strains. Mature biofilms form complex three-dimensional architectures, described typically mushroom-like forms, exhibiting channels and pillars that may facilitate nutrient exchange and waste removal. The biofilm is a sessile lifestyle that provides bacteria with multiple protective advantages by protecting them from different kinds of external stress: antibiotic, osmotic, temperature, acidity, oxidative, heavy metals, desiccation and predators. These phenotypic traits pose a challenge to the eradication of persistent infections. Like most bacteria, E. coli can switch between being motile nomadic (using their peritrichous flagella) wandering planktonic single-cells when searching for nutrients and favourable environments, i.e., a "foraging stategy" (chemotactically guided,), to living embedded in a biofilm. Underlying these choices is a complex transcriptional regulatory network that controls the switching between states. This switch mechanism is implemented by two inversely controlled transcriptional feedforward cascades, the FlhDC + σ70/σF "flagellar" cascade for the expression of genes involved in flagellum synthesis and operation, chemotaxis, and related functions in a three-layer cascade operation that drives the cell to a planktonic motile mode and promotes collective flagella-driven bacterial movement on semisolid surfaces (swarming motility)[24–27] and the σS/MlrA/CsgD cascade for control and surface adhesiveness reviewed in reference. In the σS/MlrA/CsgD cascade, the transcriptional master biofilm regulator CsgD (a transcriptional activator belonging to the FixJ subfamily of two-component response regulators[29, 30]) acts promoting sessility through the activation of expression of the csgBAC and csgDEFG curli operons, which encode the structural genes for synthesis, secretion, and assembly of adhesive curli fimbriae and indirectly activates cellulose biosynthesis. It is important to the logic of the switch mechanism that both cascades show mutual reciprocal inhibition. Thus, FlhDC + σ70/σF "flagellar" cascade downregulates the σS/MlrA/CsgD cascade expression by reducing the transcription of a subset of σS-dependent genes mediated by the regulator FliZ (a flagellar class II gene) and by maintaining low levels of c-di-GMP via YhjH, an EAL protein, and c-di-GMP phosphodiesterase (PDE) activity under FlhDC/FliA control, preventing the inhibition of flagella motor function by YcgR, a PilZ domain protein that is activated upon c-di-GMP binding. Inversely, CsgD represses the expression of genes related to flagellum formation, assembly and rotation inhibiting cell motility and also interferes with flagellar motor speed through the YcgR protein. Recently, a "pleyade" of small RNA (sRNA) has been unveiled working in this regulatory network in E. coli that are responsible for fine-tuning the FlhDC and CsgD expressions to different environmental cues[28, 33–35]. Carbon metabolisms play an important part in biofilm formation. Catabolite repression is the preferential utilization of glucose as a carbon source by bacteria[37, 38]. When glucose is available, uptake and utilization of alternative carbon sources are repressed (i.e., catabolic repression). It is well known that catabolite repression plays an important role in the regulation of multilayer biofilm formation in many bacteria. For instance, glucose represses the biofilm formation in several species of Enterobacteriaceae and laboratory strains of E. coli. Catabolite repression in E.coli biofilm formation has been reported to be mediated in part by cyclic AMP (cAMP) and the cAMP receptor protein (CRP). However, despite the notable advances in clarifying the physiology and regulatory circuitry that allow E. coli bacteria to transit adaptively among these different lifestyles, many aspects of how these microorganisms live in these diverse bacterial cities as well as how the 3-D biofilm morphogenesis is spatially organized and generated are largely unknown. Given the important role of biofilms in bacterial pathogenesis, we sought to study the E. coli behaviour under environmental conditions that have not been previously considered. In this paper, we describe a previously unknown colonizing behaviour of E. coli observed in old colonies. The genetic determinants and environmental cues that impact on pattern formation in E. coli old-macrocolony biolfilms are poorly understood. To learn more about this subject we initially use the wild-type E. coli K-12 MG1655 strain. Figure 1A shows a typical 14-day-old macrocolony of this strain developed on semisolid agar surfaces under the growth conditions defined for this study (see Methods) exhibiting a volcano-like colonial morphotype. Surprisingly, when we carried out a visual inspection of the reverse side of the Petri dish (Figure 1B) we observed a striking bacterial formation that developed in contact with the plastic surface of the bottom of the plate within the semisolid agar: a corona (Figure 1C). Similar colonial morphotypes and coronal patterns were observed with other E. coli wild-type strains: BW25113 (Figure 1K-M), W3110 (Figure 1N-O and Figure 2F-G) and NM525 (data not shown). To our knowledge, the pattern of both E. coli biofilm formations, both volcano-like and corona have not been previously reported. In this report, we described the structural organization and the environmental, nutritional and genetic factors that affect corona development. Old macrocolony biofilms are producers of E. coli’s corona. (A) Typical volcano-like appearance (morphotype) of a 14-old-day macrocolony biofilm of E. coli K-12 MG1655 strain developed over a semisolid 0.6% ABE agar surface visualized by reflected light. (B) Schematic representation of characteristic structures observed in this macrocolony. EC, external colony corresponds to the superficial aerial, visible part of macrocolony developed on the semisolid agar surface. IB, represent the internal biofilm, an agar-entrapped formation, composed of "root" (R) and "corona" (C) developed inside semisolid agar. The root is the structure generated by bacterial "fingers" that penetrate inside the agar along the toothpick-punctured zone, while the corona (C) is the biofilm structure that develops in contact with the plastic surface (PS) of the base of the Petri dish. (C) Typical 14-old-day corona of E. coli K-12 MG1655 strain. (D-E) Close-up of the corona and a coronal spike. (F-J ) Zooming view of a coronal spike removed from a corona and placed under a microscope at different magnifications. (F) Part of a corona viewed to × 40, the box indicates the coronal spike removed and observed at different magnifications: (G) × 100 (H) × 400 (I-J) ×1000. ( K ) Typical 14-old-day E. coli K-12 BW25113 strain volcano-like colony and their corona ( L-M), (L) × 40 (M) × 100 ( N-O ). Typical 14-old-day corona of E. coli K-12 W3110 strain. (N) × 40 (O) × 100 magnifications. Each box (right) represents the enlargement region in the following image (left). Scale bars: (A, K) 0.5 cm (C) 0.1 cm (D) 500 μm (E, M, O) 100 μm (F) 350 μm (G) 150 μm (L, N) 200 μm (H) 40 μm (I-J) 20 μm. Environmental and biological factors that promote the E. coli K-12 corona formation or else preclude this formation. (A) The colony (A-1) produced the E. coli’s corona when it was inoculated with a toothpick that punctured the 0.6% ABE semisolid agar and contacted the Petri dish’s plastic surface. The colony (A-2) by contrast did not generate a corona when the bacterial inoculation was carried out with a drop containing 5 μl of a stationary culture grown in LB medium of MG1655 strain deposited carefully on semisolid agar surface (B-C) The flagella-driven swimming interstitial/internal motility abolished the corona formation. Typical 14-old-day macrocolony swimming colony of E. coli K-12 MG1655 strain (B) View from the top (C) Reverse view (D) Corona developed on a plastic surface, but not on a glass surface (E). ( F) A typical 14-old-day macrocolony of E.coli K-12 W3110 strain (G) Appearance of the same colony when the external colony was removed (H-I) E. coli’s corona developed inside semisolid 1.0% ABE agar concentration. (H) View from the top (I) Reverse view. (J-K) The enlarged box region in (H-I) showing the corona at × 40 (J) and ×100 (K) magnifications. The closed white arrowheads indicate the situation of corona. The open white arrowheads indicated the coronal root. Scale bars: (A-G), 0.5 cm; (H-I) 0.25 cm; (J) 300 μm; (K) 100 μm. A typical 14-day-old completely developed corona is approximately 0.6 cm in diameter (Figure 1B) and is formed by adjoining, annularly arranged arrays of multilayered pillars, which constitute the "coronal flares" or "spikes" of the corona (Figure 1C-E). These structures, showing a radial symmetrical distribution from the coronal centre, are generally located next to the site where the semisolid agar was pierced by the inoculating toothpick. Each pillar has a characteristic bush-like morphology typically measuring 600–800 μm and is generated by growth, self-clumping and self-aggregation of cells (Figure 1F-J). The corona requires the rupture of the semisolid agar prior to its formation (Figure 2A-1). Thus, this formation was not observed in those cases for which there was no contact between the toothpick and the plastic, or that developed exclusively on semisolid agar surface (Figure 2A-2) indicating that E.coli does not have the ability to drill deeply into 0.6% ABE semisolid agar. Interestingly, it was observed by removing the exterior macrocolony that the thinnest, most superficial layer of semisolid agar was colonized by bacteria (Figure 2F-G). It is well known that bacterial biofilm formation is affected by the kind of surface on which they develop, with plastic being favoured over glass for biofilm building. Thus, corona formation was completely absent when E. coli K-12 MG1655 strain was grown in a Pirex® glass Erlenmeyer (Figure 2E). Therefore, contact with a plastic surface must trigger the corona formation (Figure 2D) which indicates that the surface itself must be sensed for biofilm formation to occur. On the other hand, it is thought that the hardness of the agar influences the behaviour of E. coli bacteria. Thus, E. coli is able to swim driven by flagella in low hardness agar (0.25-0.5%) whereas higher agar concentrations (e.g., 1.5%) impede flagella expression and thus suppress E. coli motility. Due to the fact that the corona develops inside semisolid agar, we wondered whether this also occurs for corona formation. In order to test this possibility, the ability of E. coli to form a corona was assayed in a 1.0% (1 g/L) ABE agar concentration. Unexpectedly, an increase in the hardness of agar from 0.6% to 1.0% did not reduce the size (diameter) of corona (Figure 2H-I), but, in fact, stimulated the ability of E. coli to penetrate into semisolid agar, i.e., their spreading and colonizing capabilities. Additionally, this coronal size increase was accompanied by a change in the morphological appearance of the coronal flares, which become less bushy (Figure 2J-K). Notably, the corona can even overtake and surpass the size of the macrocolony growing on the surface (Figure 2H-I). Residual corona formation was still observed at 1.5% ABE agar concentration (data not shown). Taking into account the importance of bacterial movement for colony formation, a key issue was to determine whether flagella were involved in the corona formation through the promotion of bacterial spreading in semisolid agar or in pillar formation. To address these questions, E. coli strains that were defective in flagellar and chemotaxis genetic networks were tested. All mutant strains maintained the ability to form a full-fledged corona (see Additional file1A-N, the mutants assayed are detailed in legend of this figure), indicating that bacterial spreading inside semisolid agar and the formation of coronal spikes did not require flagella, the chemotaxis sensory system or the action of the flagellar motor. However, since flagella-mediated motility is inversely regulated by biofilm formation, it could be expected that the FlhDC + σ70/σF-dependent expression of flagella would negatively affect corona formation. To test this possibility a toothpick was used to inoculate the MG1655 strain in a LB "swimming" medium prepared with a 0.5% ABE agar. As shown in Figure 2B-C, the bacterial cells are able to migrate inside the agar propelled by flagella and manage to make contact with the plastic surface of the bottom of the Petri dish, but under these motility conditions the corona did not develop. This result indicates that the flagella driven-motility inhibited the corona formation. Another appendage of the E. coli cell surface involved in biofilm formation is type 1 pili which strengthens the bacteria-to-surface interactions and promotes surface motility. A MG1655 ΔfimA strain lacking FimA the major subunit of E. coli type 1 pili showed normal corona formation (see Additional file1O-P), indicating that the processes of adhering to plastic surfaces to build coronas and the spread of E. coli when it is submerged in semisolid agar are not mediated for this kind of fimbria. Intriguingly, when the coronal spikes were disaggregated mechanically it was observed that they are apparently embedded in a matrix made up of unknown transparent adhesive substance(s) (Figure 1I-J). 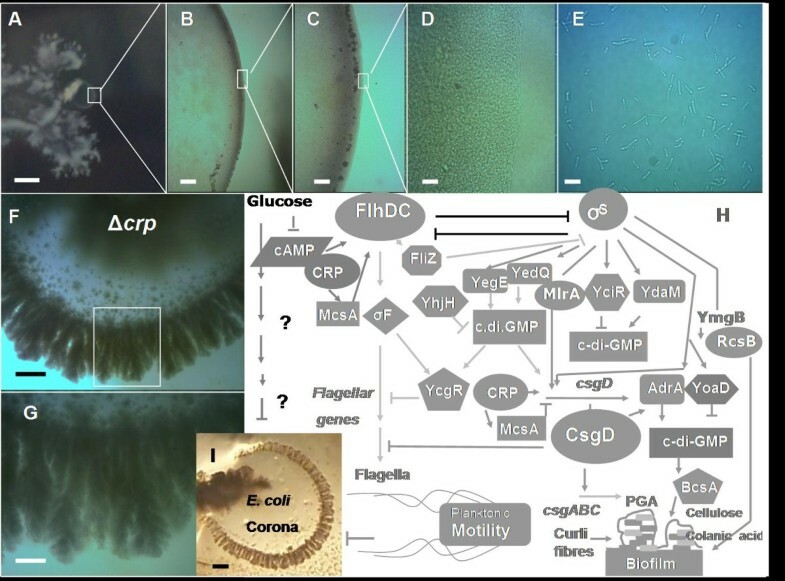 Since CsgD controls the expression of curli fimbria, we wondered if CsgD could influence the corona formation. To assay this possibility, the ability of the MG1655 ΔcsgD::aadA Specr and the W3110 ΔcsgD::cat strains to generate corona compared with their wild-type strains was assayed in 0.6% semisolid agar Both ΔcsgD mutants lacking of CsgD were not impaired in the development of the corona (see Additional file1Q-R), indicating that generation of this architecturally complex pattern does not require the activity of CsgD, and additionally suggests that the adhesive matrix that supports the coronal spikes are not formed by curli fibres. Furthermore, E. coli K-12 strains do not produce cellulose and a mutant (ΔrcsB1320) that lacks the regulator RcsB, required to activate the production of exopolysaccharide colanic acid, develops a normal corona (data not shown). Furthermore, an E. coli MG1655 Δpga::Kan strain mutant (harbouring a deletion of the pgaA gene, encoding the porin through which PGA exopolysaccharide is excreted), defective in PGA production, also exhibits normal corona formation (see Additional file1S). Altogether, these facts suggest the possibility that a novel EPS adhesive substance(s) might be produced specifically during corona formation. In the σS/MlrA/CsgD cascade, the σS (RpoS) sigma factor σS (the master regulator of the stationary phase and general stress response) and the bacterial signalling molecule bis-(3′-5′)-cyclic dimeric guanosine monophosphate (c-di-GMP) control the csgD expression[22, 28, 43]. C-di-GMP is produced and degraded by multiple diguanylate cyclases (DGCs; characterized by GGDEF domains) and phosphodiesterases (PDEs; with EAL domains), respectively. It has been reported that two separate DGC–PDE c-di-GMP control modules (YdaM–YciR and YegE–YhjH) involving GGDEF/EAL proteins which participate in the turnover of c-di-GMP, either by synthesizing (DGC, diguanylate cyclases) or degrading (PDE,phosphodiesterases) c-di-GMP, converge to control the transcription of the curli operons[22, 28, 43]. E. coli mutant strains defective in production of RpoS (see Additional file1U-V) and of the two separate DGC-PDE systems YdaM–YciR (see Additional file1T and Y) and YegE–YhjH (see Additional files1J and 1W) showed a normal corona formation. These results provide additional support for the evidence that the corona is a CsgD-independent and σS-independent biofilm formation. Another line of investigation was to determine whether catabolite repression (CR) affected coronal development. To evaluate this possibility, we sought to determine whether D-(+)-glucose could affect the corona formation. Thus, the LB medium was supplemented with 0.5% (5 g/L) of this sugar and the ability of E. coli wild-type strains to form coronas was assayed on 0.6% semisolid ABE agar. It was observed that glucose has a strong impact on the morphotypical aspect of the colony. 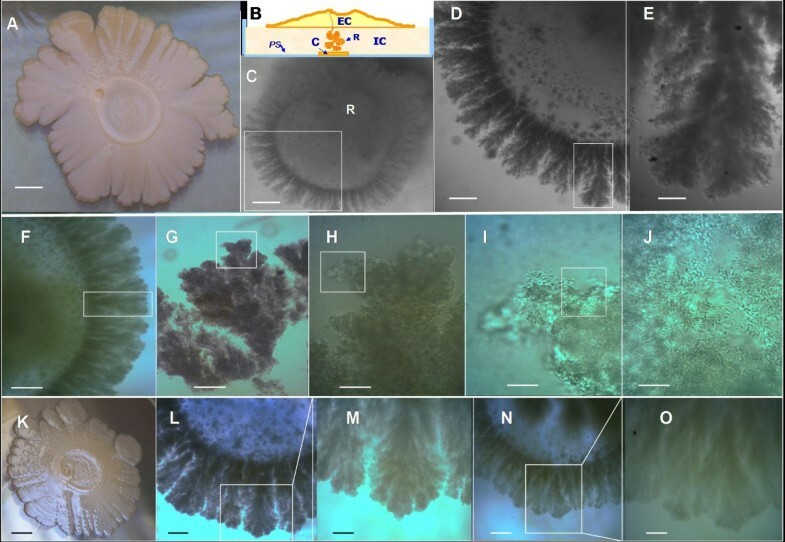 Notably the volcano-like morphotype was disrupted completely, becoming a "softer", more delicate macrocolony form, exhibiting numerous dendritic ramifications (Figure 3A), and although bacteria cells could still generate a circular formation inside the semisolid agar surrounding the inoculation point, the formation of typical coronal spikes was totally abolished (Figure 3B-E). Interestingly, the development of this circular formation was not observed in ΔfliC, ΔflhDC, ΔfliA and ΔmotA E. coli K-12 mutant strains (data not shown), indicating that under these nutritional conditions the flagella are required for E. coli’s migration inside 0.6% ABE semisolid agar. Additionally, these results suggest that although the flagella could support the bacterial migration at this level of agar concentration, the expression of flagella is probably suppressed during the formation of the corona. (A-G) Glucose represses corona formation independently of the regulatory activity of the cAMP-CRP complex. 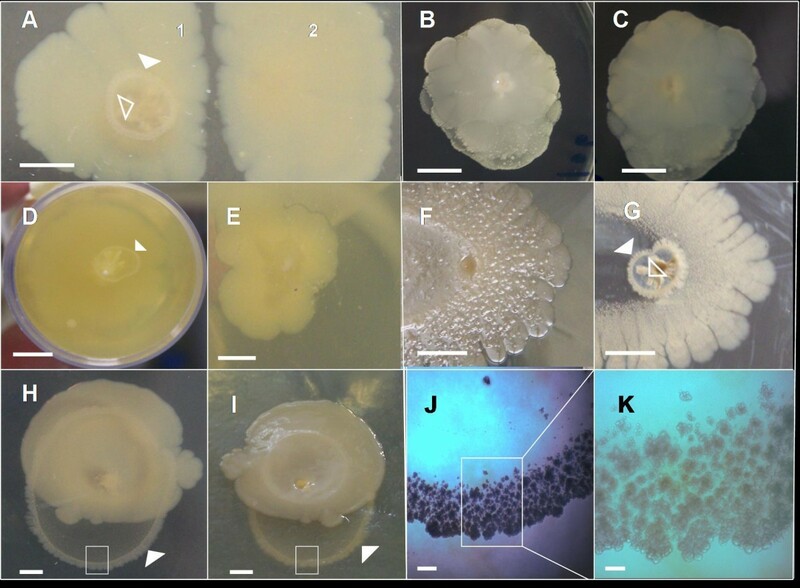 (A) A typical 14-old-day biofilm macrocolony of E.coli K-12 strain grown over 0.6% ABE semisolid agar with Luria Bertani medium supplemented with 0.5% of D-(+)-glucose does not produce a corona (B-C) Circular cellular formation surrounding the inoculation point does not produce coronal flares or spikes (B) × 40 (C) ×100 (D) × 400 magnifications (E) Individual elongated cells 5–10 μm long, typical "swarm" cells[24, 25], removed from macrocolony and observed under optical microscope at × 1000 augmentation (F-G) Corona generated by a E.coli K-12 Δcrp mutant strain (GS0549) lacking CRP protein. (G) Enlargement of the boxed region in F. Scale bars: (A) 0.25 cm (B) 400 μm (C) 200 μm (D) 40 μm (E) 20 μm (F) 350 μm (G) 150 μm. (H-I) Corona formation in relation to the canonical "core" transcriptional network that controls switching between motility and biofilm formation. In E. coli K-12, the transition from a planktonic/foraging lifestyle to biofilming behaviour is regulated by two inversely controlled transcriptional feedforward cascades, the FlhDC + σ70/σF "flagellar" cascade and the σS/MlrA/CsgD cascade (adapted from references[17, 22, 28]). Remarkably, while CRP in conjunction with the small RNA McsA has a dual role in the control of both cascades (forming a coherent feedforward loop (FFL) in order to regulate the expression of flhDC and an incoherent FFL to control csgD expression,) apparently it plays no role in E. coli’s corona formation at all. Arrowheads indicate positive regulation; perpendicular lines indicate negative regulation. Scale bar: (I) 800 μm. To determine whether the glucose inhibiting effect on the corona formation was subject to classical catabolite repression via cAMP-CRP complex, the effect of Δcrp mutation on development of corona was examined. Surprisingly, as can be seen in Figure 3F-G, the corona formation in this mutant is completely normal compared with the wild-type strain, indicating that the effect of glucose in corona formation in not mediated by this transcriptional regulatory complex. Since neither flagella nor the type 1 pili are required for corona formation, the question of how the bacteria spread inside semisolid ABE agar to create this annular pattern must be addressed. This could be the by-product of bacterial growth, but the fact that an increase in the hardness of the agar leads to an increase in the corona size (Figure 2H-I) rules out this possibility, implying that the bacterial spread inside semisolid agar that results in corona formation might depend on hitherto unknown bacterial structure(s) that actively generate bacterial movement under these special environmental conditions. The most enigmatic aspect of corona formation is how the coronal spatial architecture is achieved. In other words, how does E.coli crowning behaviour actually work? It is well established that E. coli is able to swarm outwards through the water-filled channels in plates containing semisolid 0.25-0.3% nutrient agar forming a ringed (circular) concentric band during this migration process . These classic chemotactically induced rings form because of chemotactic responses to spatial gradients generated by transport and metabolism [21, 45]. Chemotactic signalling genes known for chemoreception and chemotactic signal processing are required to form these bands  and stripes . Intriguingly, because E.coli crowning behaviour does not depend on flagella or chemotactic activities, there should be no associated circularly distributed chemotactical signals to guide corona formation. Thus, to our knowledge, crowning represents the first documented self-organized behaviour that allows E. coli to generate a characteristic annular pattern without involving chemotaxis. Hence, the corona is a good model for studying pattern formation in non-chemotactically guided environmental conditions . These observations make it possible to suggest the hypothesis that another E.coli signalling system(s) able to respond to a generated spatial-temporal circular signal pattern might participate in the control of crowning behaviour. For instance, in this respect an important point for future research will be to study the possibility that mechanisms responding to population density (e.g., quorum sensing [4, 48, 49]) might be involved in the control of corona development. Another singular aspect of corona formation that distinguishes it from other kinds of E. coli biofilm formations is that while the availability of glucose negatively influences biofilm formation via the cAMP-CRP regulatory complex, corona formation, on the contrary, does not require this classical catabolic repression system indicating that the glucose suppressive effect on corona formation must involve other mechanism(s) that are still to be elucidated (Figure 3H). In conclusion, we have presented a novel behaviour of E. coli called "crowning" which is the ability exhibited by bacteria to form a biofilm corona. Crowning expands E. coli’s repertoire of colonizing behaviours allowing it to colonize those ecological niches where flagella cannot perform adequately. 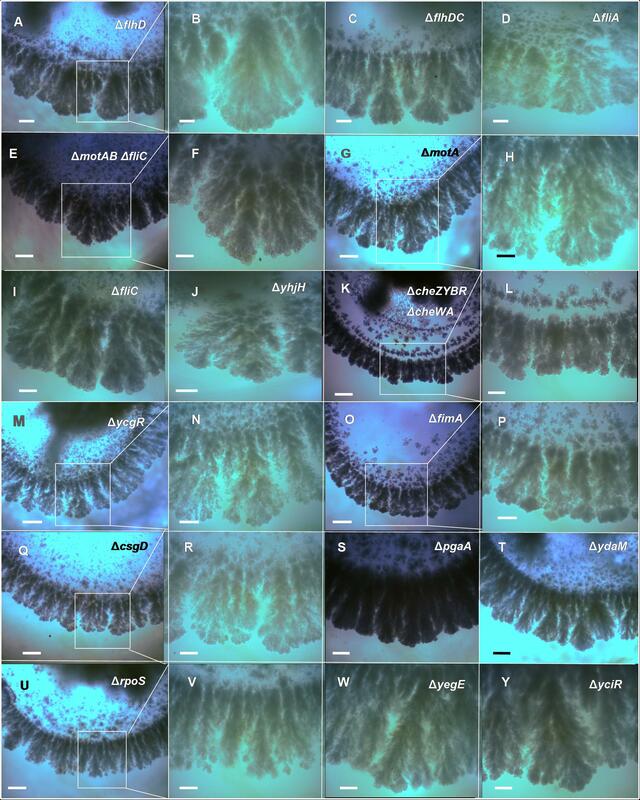 Given the notable characteristics of self-organization exhibited by the corona, this formation represents an excellent biofilm model with which to explore the molecular mechanisms underlying the generation of complex 3-D biofilm architectures. It is clear that corona formation requires exquisite spatial and temporal coordination of self-organized bacterial activity. Understanding the complex dynamics of corona formation is a challenge for future experiments. Finally, the newly studied E. coli coronal pattern and the associated behaviour that produces it, reminds us of the self-engineering capabilities of bacteria to structure their bacterial cities in order to adapt and survive in changing environmental situations. The E. coli strains used in this study are detailed in Table 1. The behaviour of each mutant strain in the corona formation process (obtained from different laboratories as is detailed in this table) was compared with its respective wild-type strain. The experiments that allowed us to unveil the E. coli volcano-like and corona formations were conducted using the following protocol: cells obtained from a colony of E. coli K12 strains (Table 1) grown in Luria-Bertani medium: 10 g/L (1.0%) Difco® Bacto-Trypone, 0.5% (5 g/L) Difco® Yeast Extract and NaCl 5 g/L (0.5%) harnessed with 1.5% (10 g/L) of Agar Bacteriológico Europeo (ABE) were inoculated with toothpick at the centre of a 8.5-cm and 4.5 cm Petri dish made of polystyrene plastic (fabricated by Sterilin® Company,http://www.sterilin.co.uk and Sarstedt® Company,http://www.sarstedt.com respectively) containing 30 ml of LB medium jellified with the indicated ABE concentrations. The plates were sealed with parafilm® to prevent loss of water. After 14 days of incubation at 37 °C, the plates were photographed with reflected light with a digital Kodak EasyShare Z710 camera. D-(+)-glucose 0.5% (5 g/L) (provided by Merck Company) was added to LB medium when indicated. The microscopic images were taken with a Ultralyt ULNM-90-10000 microscope (made by Brown & Crown Company). The images shown in Figure 1C-E were taken with a Leika M205 FA stereoscopic microscope coupled with a DFC350FX digital camera. The images of the figures were framed with Microsoft Photo Editor software and composed using the Powerpoint software program. Notes: (*), Wild-type to corona formation. The authors express their gratitude to Ilias Tagkopoulos, Jean Marc Ghigo, Paul S. Cohen, Takeshi Mizuno, Hideyuki Suzuki, Regine Hengge and Gisela Storz for kindly providing the strains used in this work and cited in Table 1. We thank Howard Berg and Liyan Ping for providing us the E. coli strain HCB1668, and also to Dra. Paola Bovolenta and her colleagues, from the Centro de Biología Molecular Severo Ochoa (CBMSO), for giving us the opportunity to use their Leika Microscope, as well as to David Hochberg by his critical reading of manuscript. This work was partially supported by grant CGL2012-34020. JMGG and RA participated in the design of the study as well as drafted, developed and wrote the entire manuscript. JMGG performed the first phenotypic observation and carried out the phenotypic and genetic studies. Both authors read and approved the final manuscript.